The Cricetidae are a family of rodents in the large and complicated superfamily Muroidea. It includes true hamsters, voles, lemmings, and New World rats and mice. With almost 600 species, it is the second largest family of mammals, and has animals in it in the New World, Asia, and Europe. The cricetids are small mammals, ranging from just 5 to 8 cm and 7 grams in weight in the New World Pygmy Mouse, up to 41 to 62 cm and 1,100 grams in the Muskrat. How long the tail is depends on how big the body is, and the tails can be either with hair or a little hair. Most species have brown fur, with a white colored underbelly, but there are also many other patterns, especially in the cricetine and arvicoline subfamilies. 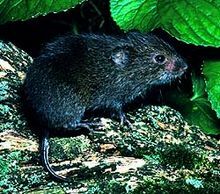 Like the Old World Mice, cricetids live in a wide range of habitats, in the high Arctic to tropical rainforests and hot deserts. Some are good at climbing, with long balancing tails and other way to help them to climb, while others can swim, with webbed feet and small external ears. Yet others are burrowing animals, or ground-dwellers, which live in the ground. Their diet is also variable, with herbivorous, omnivorous, and insectivorous species known. They all have large, biting and chewing, incisors separated from grinding molar teeth by a gap, or diastema. There can be a lot of these animals in a very short time, because the mother gives birth to them after 15 to 50 days, and they have a lot of babies at one time. The young are usually born blind, hairless, and helpless. Sigmodontinae - New World rats and mice, predominantly South American genera such as brucies. Cricetidae Facts for Kids. Kiddle Encyclopedia.